Airstream owners tend to be very loyal to the brand, so finding used Airstreams can be somewhat challenging, but it is not impossible. Because the exterior design of these campers never changes significantly, paired with the fact that they hold up so well, people who purchase Airstreams tend to hold on to them for many years. However, sometimes people decide they need a different size camper, choose to transition from a travel trailer to a motor home, or decide to give up RV travel altogether. The units they no longer want may be exactly what you are looking for! VintageAirstream.com - This website is an excellent resource for anyone looking to purchase or sell a used Airstream camper. Whether you're looking for a vintage model or one that's just a few years old, this site has an outstanding selection. You can search available listings by specific criteria, including location, price range, model, year and more. If you register with the site, you'll receive a free subscription to the Vintage Airstreams e-newsletter. You'll be able to view a variety of interior and exterior photos of any units that catch your attention, so you can make an informed decision about which travel trailers you may want to check out in person. Local Airstream Dealer - Companies that specialize in selling new Airstream campers might be a good resource for locating pre-owned Airstream trailers. If there is a dealer in your area, it's certainly worth paying a visit to the lot. You may find a selection of used Airstreams on the lot that are being offered on consignment or that have been traded in at the dealership. Even if new units aren't available, the dealership may know of people who are looking to sell a used model before purchasing a new one. The sales manager will probably be happy to share such information with you, because doing so may help him or her close a deal on a new model. 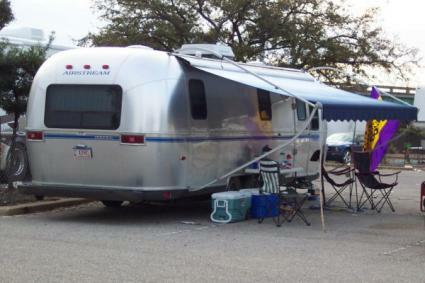 Airstream Classifieds - Airstream owners looking to sell their campers often post advertisements on this forum, so you may be able to find a unit that meets your needs by searching the listings. You can also use it to spread the word that you are in the market by placing a "wanted" advertisement on the site. 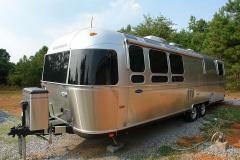 Be as specific as possible, letting Airstream owners who may be interested in selling know what you are looking for. ebay - When you're looking for any kind of previously owned camper, it's a good idea to see what might be available on EBay. At times, there may be a very limited selection of units listed on this site. However, new items are listed regularly, so it's a good idea to check back regularly while you are conducting your search for used Airstream trailers. Be prepared to spend a little bit of time looking for the perfect used Airstream that meets your needs. You may get lucky and find exactly what you want as soon as you start searching, but it could take quite some time. Even though you may not locate the ideal RV for your needs right away, when you do become an Airstream owner you'll be able to enjoy years of camping with your friends and loved ones. Any Airstream enthusiast will tell you that these high quality campers are definitely worth the wait!